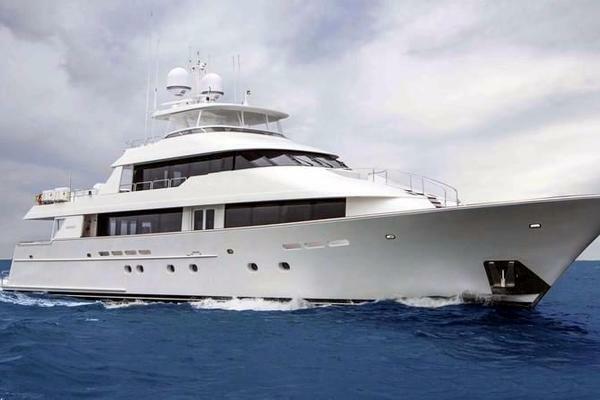 PROJECT DESTINY is an all steel construction semi displacement motor yacht, powered by twin Caterpillar C32 Acert diesel engines.The vessel has a 7 guest stateroomlayout with 3 crew cabins locatedforwardplus a captains’ cabin on the wheelhouse deck. The 7 stateroom arrangement features a veryspacious full beam Master stateroom on the main deck.The main deck also features a large saloon with dining area and an enclosed galley with seating for informal dining. Forward of the main deck’s social areas is the owners full beam stateroom with private office space. All guest staterooms have private ensuite bathroomsand layouts can be configured to owner’s specifications. The wheelhouse deck features a spacious pilothouse with seating as well as a sky lounge for relaxing or playing cards and games.The large crew areaforward features two comfortable staterooms each with ensuiteplus dining and galley area for the crew. United Yacht Sales New Jersey would love to guide you through a personal showing of this 137' Miss Tor Yacht 2017. This yacht for sale is located in Unknown Turkey and priced at $14,500,000. For a showing please contact us by filling out the form on this page and we will get back to you shortly!